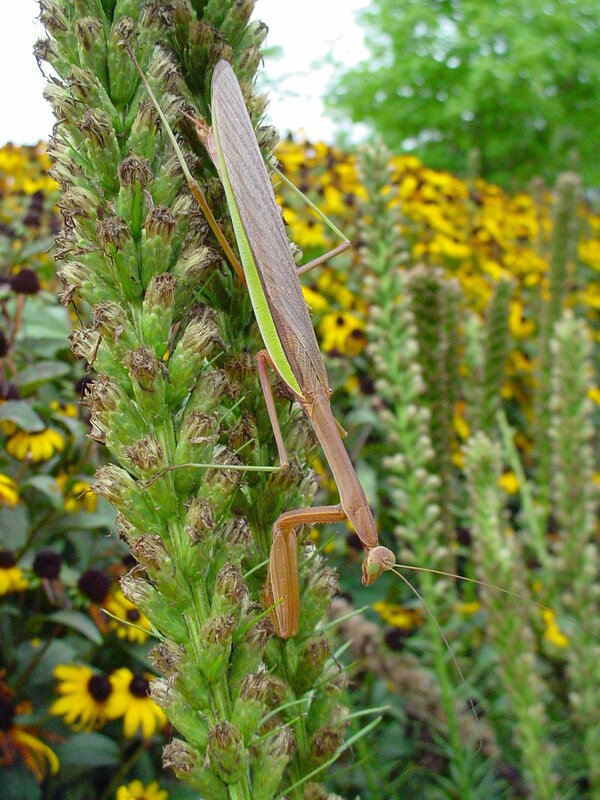 One of our favorite insects at the Chicago Botanic Garden is the praying mantis. So we were very excited to obtain an egg case earlier this spring. We decided to keep it indoors so we could watch it hatch, and then release the newly hatched insects into the Garden. 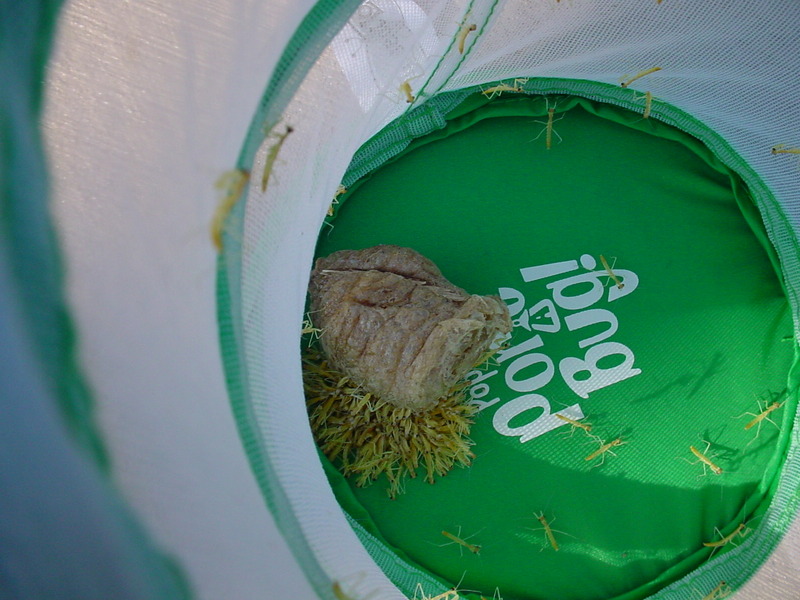 About 100 praying mantises emerged from this ootheca and were released into the Grunsfeld Children’s Growing Garden. 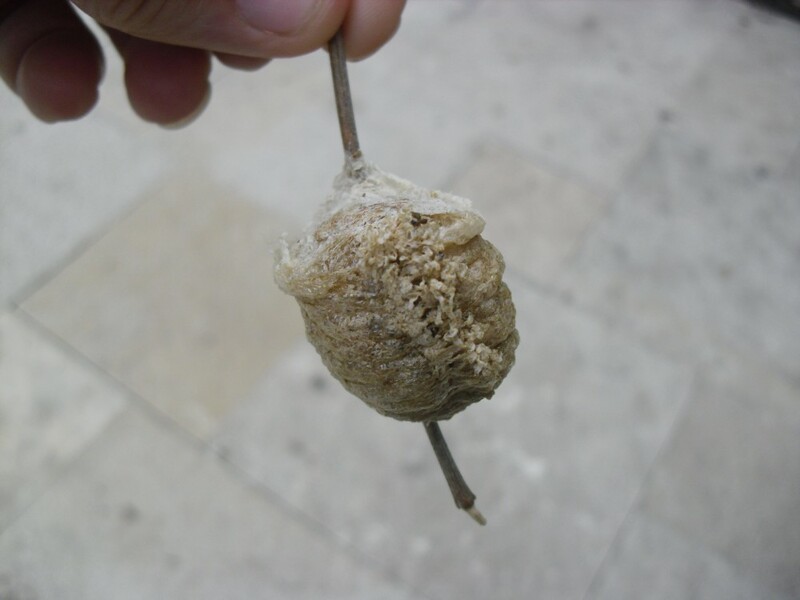 A praying mantis egg case is called an ootheca (pronouned oh-uh–THEE-kuh). The plural is oothecae (oh-uh-THEE-see). The ootheca was produced by a female praying mantis last fall. She laid her eggs in this foam of protein that hardened around a stick and protected the eggs through the winter. The eggs usually hatch in mid-June to early July. 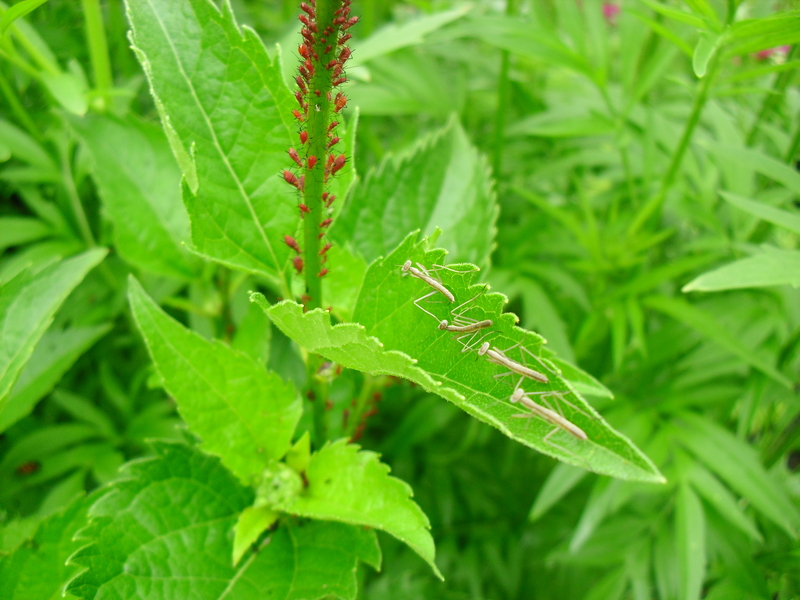 The half-inch-long immature praying mantis nymphs resemble the adult, but they do not have wings. Colorless praying mantis nymphs emerge from the ootheca all at one time. During their first hour, they darken in color to blend in with their surroundings. After our praying mantises hatched inside an insect cage, I discovered that a bed of false sunflower plants (Heliopsis helianthoides) in the Grunsfeld Children’s Growing Garden was infested with red aphids. I released the praying mantises, and the hungry babies immediately began to feed. At first, the praying mantis babies seemed a little bewildered by their new surroundings, but they quickly acclimated. This mantis held very still as it eyed its prey. These four little mantises lined up and stared at the aphids that would certainly become lunch soon. It wasn’t exactly aphid carnage—much to the disappointment of our eighth grade Camp CBG helper, Joshua, who assisted me with the release—but the young predators did appear to enjoy their first meal. By the end of August, some of our little friends will be as big as this praying mantis (and just as hungry)! 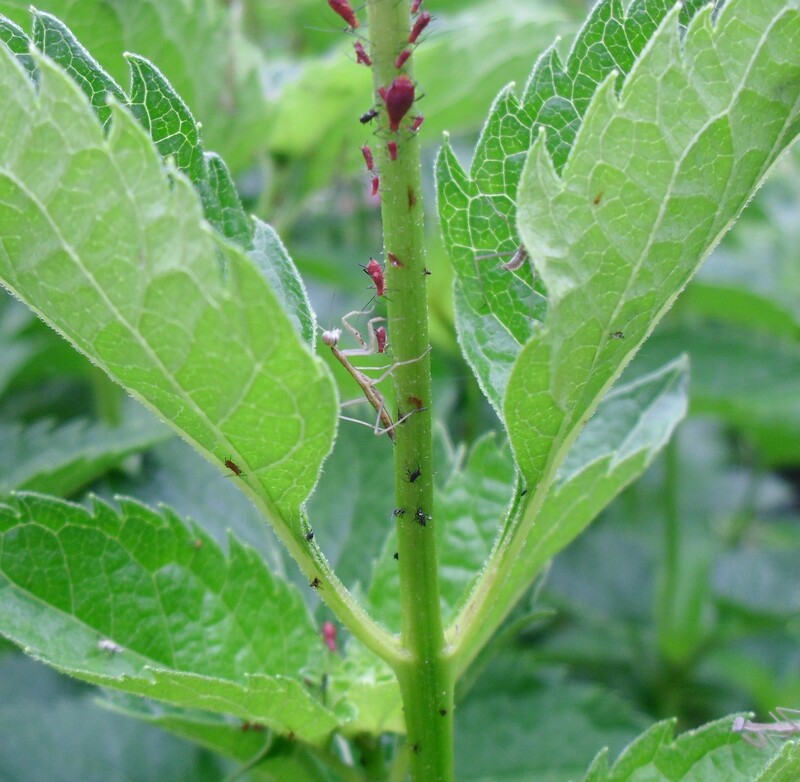 It may surprise you to know that although it looked like a bad infestation, aphids are not really a big problem for the plants. When they are very abundant, it does not take long for natural predators like praying mantises and ladybugs to find them and move in for a feast. Predatory insects will take care of the problem if you are patient and let nature take its course. If aphids show up in your garden and they bother you, we recommend hosing them off with water rather than using an insecticide, because chances are pretty good that there are beneficial insects on your plants, too. Hosing with a strong jet of water will knock off all the bugs and kill most of the aphids, but it won’t be as devastating to the mantises or other beneficial insects as poison. We have placed praying mantis oothecae in the Regenstein Fruit & Vegetable Garden and Elizabeth Hubert Malott Japanese Garden, as well as in the Children’s Growing Garden, to ensure that there will be a population of our favorite insect for you to find. Many of them will survive on aphids and other insects they capture and devour on our flowers, and they will grow up over the summer. The next time you visit, stop by and see if you can find them helping our plants remain healthy and less bothered by pests. I bought one of the egg cases several years ago put it inside a paper bag and waited. One day I came home from work and saw what looked like a lot of little mosquitoes. I wondered where they had all come from when I realized they were escaped praying mantis. There were still many in the bag, so I gathered up as many as I could, took them all outside and released them. That fall one of them laid an egg case. Unfortunately they did not hatch the following spring. It’s really amazing when they emerge, isn’t it?! We were not sure what would happen with our oothecae after this brutal polar vortex winter and so we were very happy that ours survived. We had one last year that never hatched. I’ve recently learned that there are some predatory wasps that lay their eggs in oothecae. So different things can prevent the praying mantis nymphs from hatching from the eggs and emerging in the world. I love wild flowers around my habitat. Now I begin to take photos of some wild flowers. But I don’t know the names of them. One kind of flowers looks like the the one in one of your photos. I’d like to contact you. 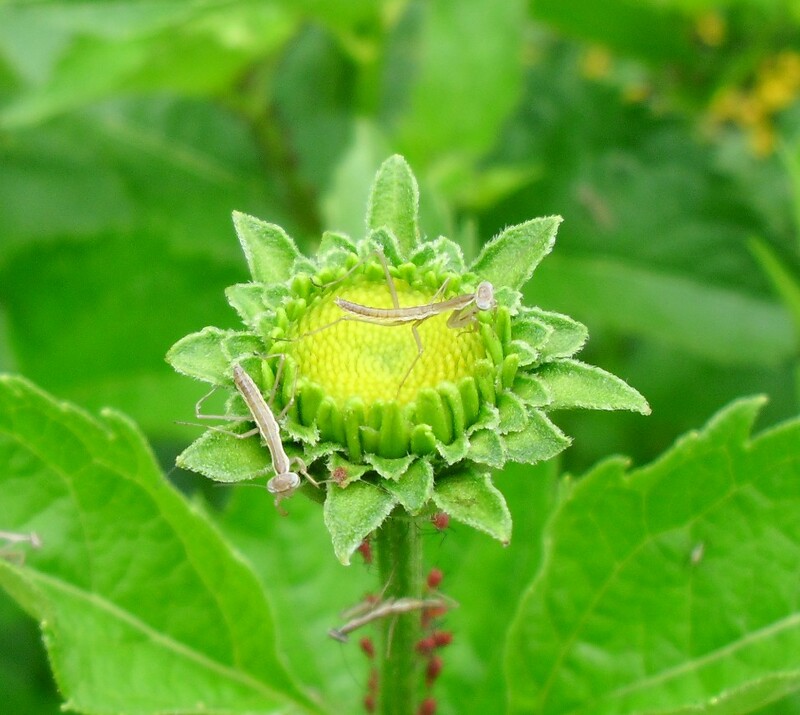 The praying mantis nymphs are all on false sunflower, Heliopsis helianthoides. The picture of the adult, which was taken a few years ago late in summer, shows a blazing star, Liatris (not sure what species), and in the background the yellow flowers are black-eyed Susan, Rudbeckia hirta. I’m hearing that families are visiting the Garden and looking for the praying mantises we released. I was in the Growing Garden this morning and found one little guy on the false sunflower. It has obviously molted and grown since I released it — it was about 3/4 inch long and poised to attack. I also found ladybugs hanging around the flowers. If you come to the Garden to find these creatures, be patient because they are not obvious. You’ll only find them if you slow down and look carefully. And please do not disturb any of the insects.